True happiness is to enjoy the present, without anxious dependence on the future, not to amuse ourselves with either hopes or fears but to rest satisfied with what we have, which is sufficient, for he that is so wants nothing. Even though it’s only been a few days since our last update, we’ve still managed to cover some ground – changing states and visiting another National Park! Over the weekend we rode into the northern portion of Canyonlands called Island in the Sky for another visit and then on Sunday we packed up and headed out. 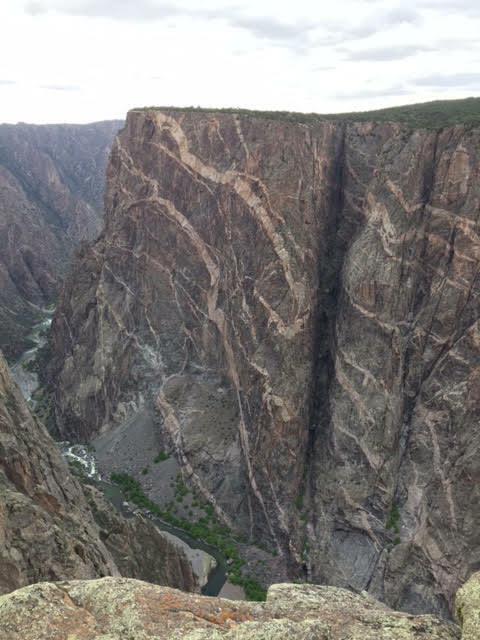 We headed east, returning to Colorado in order to visit Black Canyon of the Gunnison. It’s a relatively new park, only having been instated in 1999, though it’s been a National Momument since the mid 1900s. Even though there isn’t snow on the ground and the roads are all open, it’s still a bit early in the season to visit. On the one hand, that means that we’ve been avoiding crowds and it’s been peacefully quiet, but that’s because it’s been chilly during our visit. 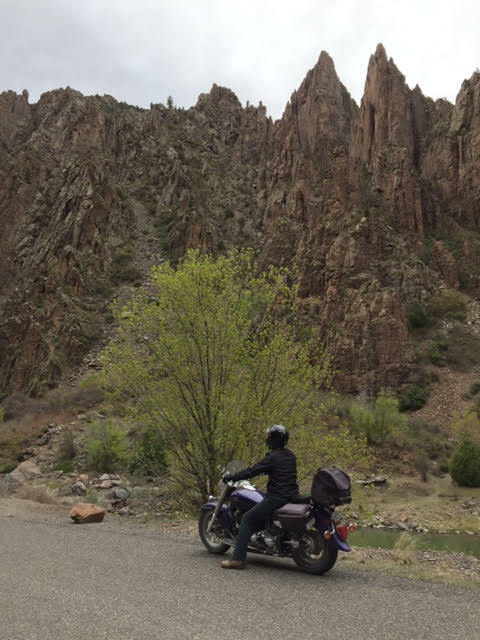 We hopped on the motorcycle for a trip down into the canyon on the East Portal Road to ride alongside the Gunnison River. It was quite a steep ride down, Ashley kept sliding forward on her seat! Being inside the canyon is a unique experience. It’s beautiful, but also intimidating. Like being inside a slot canyon that has teeth! After checking out the visitor center and watching the park movie about the early exploration of the canyon (including the use of inflatable mattresses to raft the river!) we continued to the end of the road to check out the overlooks. Unfortunately, the weather was threatening rain/snow so we didn’t stay out for long and retreated to the RV to warm back up. While the weather wasn’t as bad as predicted, there were some snow patches still sticking in the morning, though they melted quite quickly. 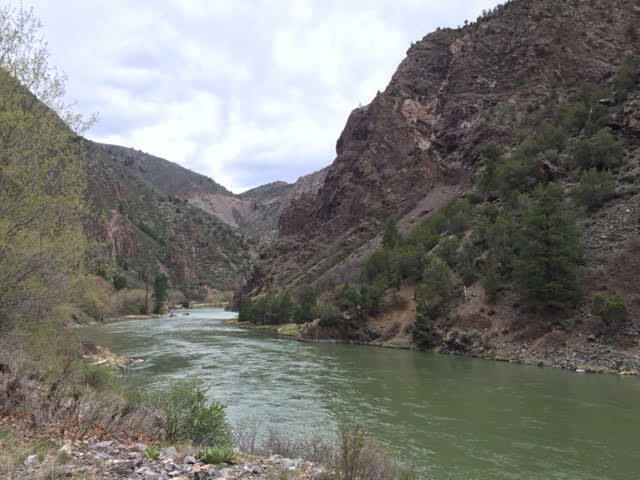 Pictures fail to capture the colors, depth, and general sensation of the canyon. These last few months everyone’s been asking about our upcoming plans, both for the next leg of our quest and the”what’s next” after we finish. As for the next leg of the quest, we have only a handful of states and National Parks left to visit and the current plan is to finish visiting them all by the end of July. 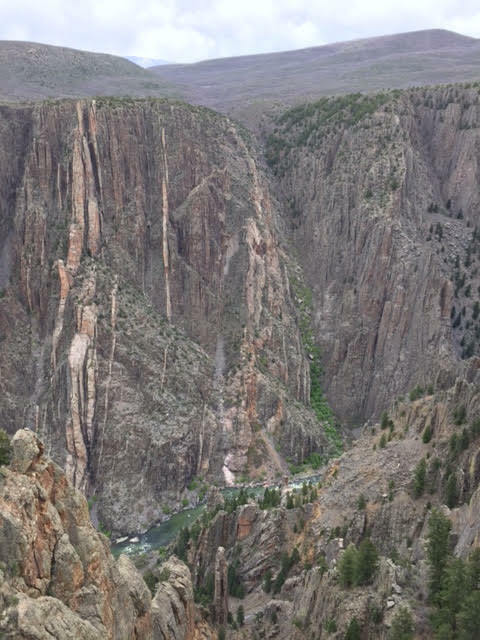 After exploring what we can of Rocky Mountain National Park here in Colorado, we can head back east through Oklahoma and Arkansas (Hot Springs NP) then to Mammoth Cave before working our way up through New England to Maine and back down to Savannah, GA in July for a family get-together. Three weeks later we have a 25-day permit to hike the John Muir Trail in California. And then we get to begin our next adventure in life. After much pondering, consideration, and discussion we’ve decided to… wait and see! We have lots of ideas about what sounds best but are currently delaying the decision. It’s hard not to think about it since we’ve had so many questions from famiy and friends, but part of our rationale is that we get lost in the debate and forget to enjoy our current location and adventure over concern about the future. By focusing too much on future plans we forget to enjoy and appreciated the present, and the amazing things we are experiencing at this very moment. It’s a hard balance that we are continually striving to make. We have put out some feelers looking into future options, so we’re not ignoring it completely, but at the moment we’re aiming to appreciate the amazing journey that we’re currently on.